Leek moth (Acrolepiopsis assectella) has spread throughout Southwestern Ontario and has been identified as far west as Lambton and Chatham-Kent counties. The range of leek moth has likely increased over the last decade through wind currents and by movement of infested seed cloves. The management of leek moth will be of concern to all garlic growers in Southwestern Ontario if it is not already. This spring, leek moth pheromone traps were mounted on stakes near the edge of garlic fields in many areas where leek moth has not been previously identified including Lambton, Kent and Huron counties. The traps catch adult moths which are small (5-7 mm), reddish brown, and have a white triangle shaped spot that is sometimes visible depending on how long the moth has been on the trap (Figure 1). Previous research in eastern Ontario and in New York State indicates there are three flight periods for leek moth, with the first flight by overwintering adults in the spring, a second flight by first generation adults in early summer, and a third flight by second-generation adults late summer. With a slow start to the season, two flight periods have been observed at our sites so far in 2018, that of the overwintering generation towards the end of May and that of the first generation peaking at the end of June. Depending on how the summer progresses, we should expect to see an additional flight sometime in late July or August (Figure 2). 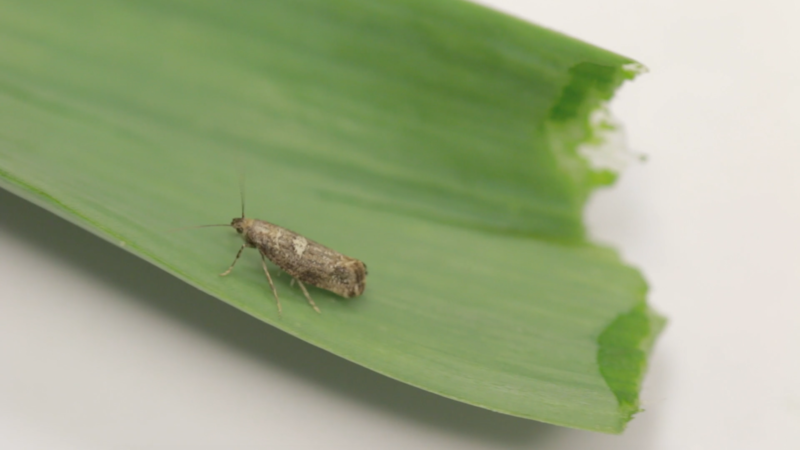 Leek moth will have three, potentially four generations per year in Southwestern Ontario. Damage to garlic plants by leek moth has typically been observed in fields where there were over 10 moths captured on the trap per week during the second flight. Figure 1. Adult leek moth on sticky card accented by the tip of a paperclip. The best way to determine the level of leek moth pressure in your field is to monitor using a pheromone trap lined with a sticky card. Traps and lures can be purchased from Cooper Mill Ltd (ipm@coopermill.com) and Distributions Solida (info@solida.ca). Order Delta 1 traps with removable liners and mount the trap in the field at the end of April as adult moths emerge from overwintering spots when night temperatures reach 9.5°C. Place at least two traps per field, near perimeters, as this is where the highest leek moth numbers are usually observed. Each trap requires approximately 14 sticky cards for the season and if the pheromone lure is changed every three weeks, you would require approximately five lures per trap. Extra traps are always a good idea, as traps are sometimes lost or damaged. It is also possible to estimate peak flights using a degree day calculation developed by Dr. Peter Mason’s Lab at Agriculture and Agri-Food Canada. At a threshold of 7 °C, leek moth requires approximately 445 degree days to develop from egg to adult ((Max Temp + Min Temp)/2) – 7°C). Accumulation of degree days starts one week following peak flight of male moths captured in pheromone traps, and is reset to zero for each generation. Insecticide applications are targeted at the second generation of leek moth eggs / larvae (those produced by the first generation adults) usually around late June into early July. If the number of overwintering moths trapped was low and minimal damage by first generation larvae was seen in the field, a single insecticide application 10 days after the peak of the second flight would be most effective. If the damage to the crop was moderate to severe the previous year, and/or the trap counts of overwintering moths were high and damage by first generation larvae was observed in the field, two insecticide applications may be necessary. Two applications will target the most larvae (Figure 3) if they are applied 3 days after the date of peak moth capture and the second treatment 14 days later. Matador 120EC, Bioprotec CAF, Delegate WG and Entrust are registered for leek moth in Canada. These insecticides are most effective when they make contact with the larvae which is difficult if they have already burrowed into the plant. Based on our trap captures in Figure 2, that timing window has closed for garlic for 2018. Anatis Bioprotection has commercialised a parasitic wasp, (Trichogramma brassicae) that parasitizes leek moth eggs so that they do not hatch. Cards containing the pupae of the wasps can be distributed throughout the field over a 10 week period. New cards should be added weekly and 40 cards per acre has been suggested for control. These wasps may be susceptible to products applied to manage other insects. Floating row covers are often the most effective pest management strategy. Row covers are hard to implement over large acreages and must be applied prior to adult activity in each generation in order to be effective. Always observe a 3 year or more crop rotation and avoid planting near infested areas from the previous season if possible. Collect and destroy any scapes or stems that show any sign of leek moth damage including the pupae (Figure 4). After the crop is harvested, check for small, 2mm-wide holes in the sheath of the garlic bulb and cloves and cull any that you find. Burying plant debris after harvest will also reduce pupae and larvae populations. Figure 4. Leek moth pupae. For more information and visuals of leek moth damage and life stages, see OMAFRA factsheet 08-009, Leek Moth – A Pest of Allium Crops. Article written by Hannah Fraser, entomologist for horticulture and Travis Cranmer, vegetable crops specialist.